Heard of Eklavya: The Royal Guard? I wouldn't have, if I wasn't a huge fan of the creative geniuses at Animagic India. Chetan, Gayatri and Sumant were part of Vidhu Vinod Chopra's creative team for Eklavya. They developed the storyboard for the film, animated the titles and worked on the special effects - flying knives and all! If the behind the scenes look interests you as much as it does me, then this in-depth exclusive will enthrall you. And, if you heard about the quandary surrounding Amitabh's beard, then jump straight to this. Gayatri has also been busy with Rawworks, her brand of handmade eclectic crafts. This Krishna lamp is one of my favorites. I would have bought it if I had been around for the exhibitions! 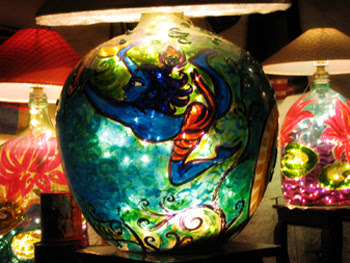 See the Rawworks slideshow, which features the crafts she exhibited at The Kala Ghoda Arts Festival, 2007. And you know what else? That IFR mascot up there on the top right corner of this blog? That's courtesy of Gayatri Rao. How many bhendi do you want? Is 10 enough? 1...2...3...I think I have picked up less than 10. How many do you want? When I recover from this, I will post again. Don't get me wrong. I am eternally grateful that he does the grocery. For now though, I need to go lie down. Good things are often the outcome of bad experiences. 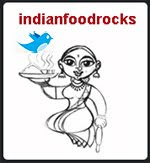 Indira's blog Mahanandi was brought down by a web host with a bad attitude. Up went Dining Hall. In Indira's words: Dining Hall is where we can get together to discuss and exchange tips and pointers for fruitful food blogging. So hark over to Dining Hall where the posts and tips are already rolling in! So he's back! Sans curtains, of course. There was no way that was happening. And I knew that when I asked but the sheer thrill of asking for them was too much to pass up on. The insane request was met with the longest and most expensive silence that made the trans-Atlantic lines sizzle. That sudden unexplained static you heard? Yup! Now you know what that was. As I sit back and analyze the whole situation, I wonder: what happened to me? There are very few things I really want and even fewer that I really need. In fact, the pictures I post on my blog are a silent testimony to the old and tired stuff that I have. So I was rather amazed at myself when I came up with this long shopping list. I rationalized parts of it by saying the books are really for Medha - and they are. But they are also for me. I haven't read anything half decent for years. By the end of the day, my eyes are just too tired to read small print. Audio books have helped to a certain extent but I need to get back to reading because I miss it so much. I was always found with my nose buried in a book. Then Life happened, stresses increased. I stopped reading. It's not even like I watch TV. I don't. I feel isolated and pushed into a corner, even though I read the news voraciously. I have tried to get back to reading without much success. I saw a lifeline in Medha: Easy to read books. Large print. A "together" activity. Win-win all around. But, what about the rest of the list? Try as I could, I could not understand this need to have. Where was I going to keep all that stuff? Oh my! I desperately need to detoxify! A few years ago if anyone had told me that I would covet stackable katoris made of stainless steel, I would have laughed my head off. Of course, it is nice to ponder over all these things once you have the stuff you wanted! More than slightly upside down, dare I say. I need to get back down to earth. What better way than food. And food for the soul. 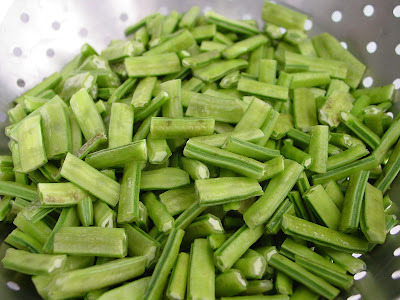 Chitkya, guar, guvar are cluster beans that are firmly ensconced in traditional Maharashtrian cooking. In our home, they were always on the menu whenever there was an auspicious occasion. My mother made these in three different ways: with bhopla, with kale vatane or by itself. The recipe remained pretty much the same. I particularly loved the version with kale vatane. It made the veggie dish even more earthy for me. The cluster beans I got at the Indian grocery store weren't anything to shout about but, on the other hand, getting fresh produce in the kind of winter we've been experiencing is something to shout about. Kale vatane are dried black peas that I have not seen in any regional cooking apart from Maharashtrian and Goan cuisine. 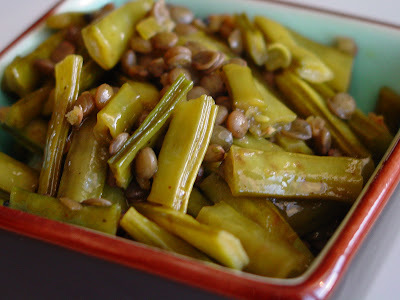 (If you are familiar with this legume in other cuisines, please let me know!) One kala vatana, many kale vatane. My mother used to special order these from an old doddering fellow, who also brought us the best turmeric powder, red chilli powder, tamarind and other spices sourced from Sawantwadi to Nagpur in Maharashtra. I remember a time when we didn't see him for months and the story was that he had passed away. We mourned his loss and our loss till one day the doorbell rang and there he was, like an apparition, at the door. He had been very ill and it took him months to recover and get back to his business. We urged him to retire but he said he wasn't doing it for the money anymore. He missed the joy he brought to so many homes when they saw him with his heavy bags, filled with spices and hard-to-find grains. 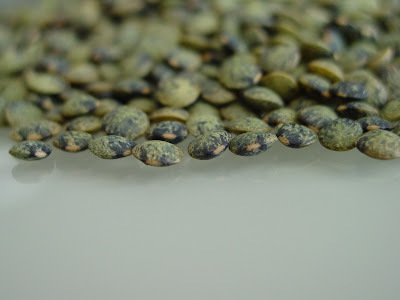 Puy lentils are like a chubbier green version of masoor (red lentils) and, like kale vatane but unlike masoor, they hold their shape. They also have a taste, again very different from masoor, that made them a great substitute for kale vatane. 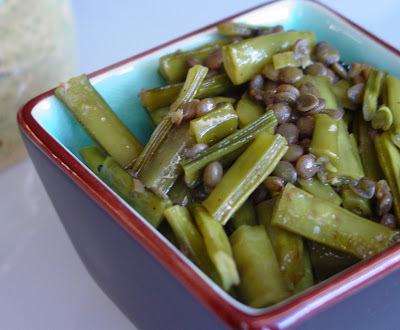 These green lentils are also used in salads. I was really quite thrilled with how delicious my chitkyachi bhaji was with these lentils. Cook the 1/4 cup puy lentils, preferably in a pressure cooker. One whistle and it's ready. I let it go to 2 whistles by mistake and some of the lentils sort of got mushy. Most of them were still OK, as you can see in the pictures. If they are not cooked in a pressure cooker, it could take up to 45 minutes on the stove for the lentils to cook. Heat the oil in a kadhai or wok. Add mustard seeds and when they start popping, add hing. Add turmeric powder, red chilli powder to the oil. Then increase the heat to medium-high and add the chopped guvar and stir so that the phodni coats the vegetable completely. The beans must be topped and tailed before being chopped. 1/2inch to 3/4inch is a good length to chop these into. Add the jaggery, salt and toss. Add water, lower the heat to medium-low, cover and cook till the guvar is almost done. About 10-15 minutes. Drain the cooked puy lentils and add them to the kadhai. Add salt, mix well and cook until the beans are completely cooked. And there you have your earthy chitkyachi bhaji. Serve hot with rotis and pickle. 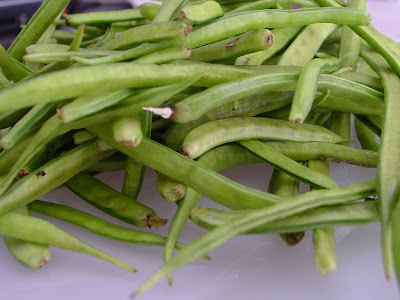 Cluster beans in India are smaller and less plump than the variety we get here. I also found that I did not need to string the beans. I wonder if these beans have been developed to be string-free like French beans or if the species we get in the US are naturally string-free.